Arguably the most influenced cuisine for Indian culinary techniques and methods for cooking meat goes to the Mughals and are still winning the hearts of millions of foodies all over the world and definitely will not retire in future. 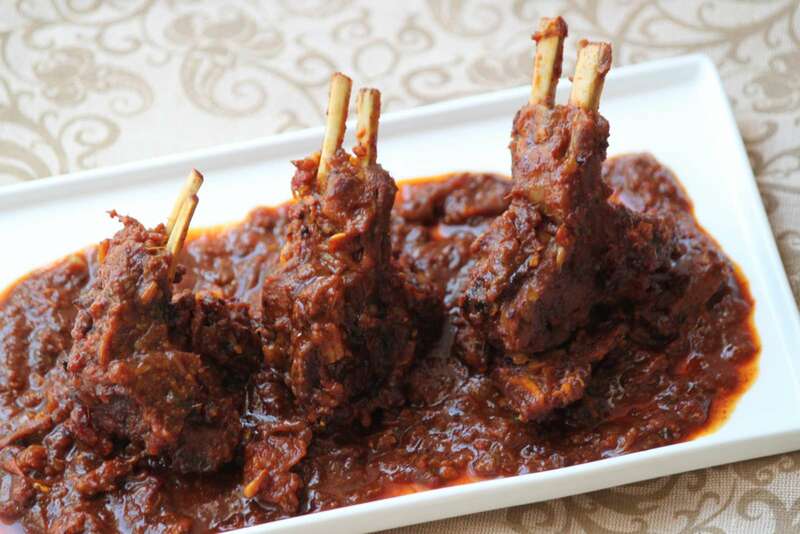 The recipe uses goat ribs which is the most tastiest part of the goat and ideal for any special masala preparation. Marination and slow cooking of the meat is adopted especially for such recipes. Lamb chops will also work well with this recipe, though the mutton meat will take a bit longer to get fully cooked, but the end result will be delicious. The use of aromatic Indian spices like cardamom, cinnamon, saffron, is a perfect match to cook with Mutton chaap. Serve Mutton Chaap along with Rumali Roti Recipe and Mooli Raita Recipe for a brilliant sunday lunch. Clean and wash Mutton chops and keep it aside to drain water for some time. Grind fennel seeds into powder. Marinate mutton chop with ginger paste, garlic paste, sauf powder, red chili powder, cardamom powder, black pepper powder and salt. Let it marinate for at least 3 hours. In pressure cooker put marinated mutton chops and 1 cup milk and evaporated milk. Let it cook on high heat till one whistle. After that lower the flame and cook for another 6- 8 minutes. Take care not to over cook the mutton. Let the pressure cooker cool down completely before opening it. There will be some milk still in the pressure cooker. Place it back on high flame to dry up remaining milk. Keep stirring it occasionally so that the mutton chops don’t stick at bottom. Once all the milk is evaporated switch off the flame. By now mutton chops will be cooked but not completely soft. Remove the mutton chops in a bowl and let it cool. In a separate bowl take hung curd add remaining half black pepper powder, kashmiri red chili powder and salt to taste. Mix well. Once the mutton chops are slightly cool add this curd mix in the bigger bowl and try and coat all the chops well. Heat a frying pan and powder little oil to shallow fry the chops. Since the chops are already cooked, just cook until the outer layer is crisp. Alternatively you can air fry them ( I have air fried the mutton chops) by preheating the air fryer at 180 deg C, for 10 minutes. Lightly grease the bottom of tray and place 4-6 pieces at a time, don’t overcrowd the tray. Let it cook for 4- 5 minutes. Open the air fryer, lightly brush oil on both sides of mutton chops and then again cook for 3 minutes. Kashmiri mutton chaap is ready to serve.